Sign Studio LA is Proud to Be One of Vista Systems Top Dealers in California! 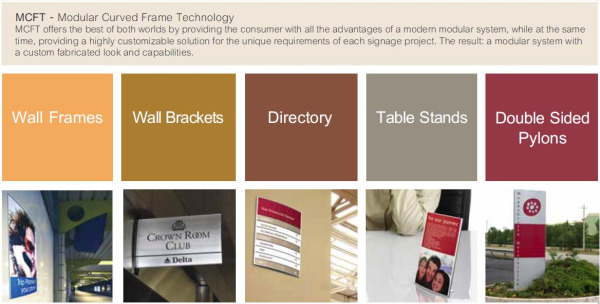 Vista System, a world leader in modular Wayfinding sign solutions. The Sign Studio is one of the top California dealers of Vista System products. Vista System provides some of the most innovative and useful sign products on the market today. They are a global leader in sign solutions. The latest offering from Vista System is a new sign concept called Modular Curved Frame Technology (MCFT). 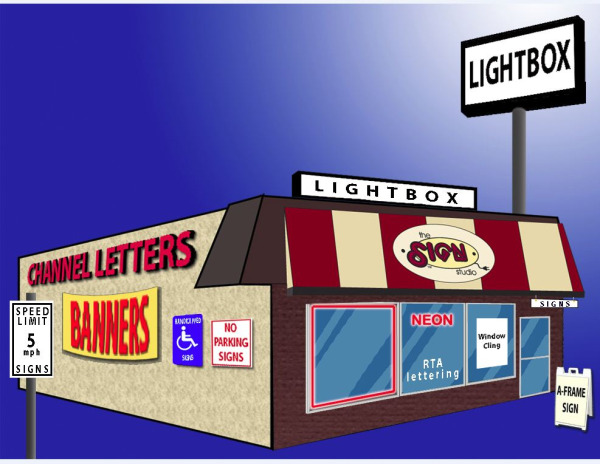 This concept was developed by sign professionals who have utilized their wealth of experience to meet their goal of combining the benefits offered by modular sign systems with the benefits of custom designed signs. MCFT makes it possible to harness the advantages of modern modular systems while retaining customization. Vista Systems produces a variety of directional signs. These signs include projecting signs, table stands, directories, double sided pylons, post pylons, suspended signs and triangular pylons. All of these signs are produced with the use of the state-of-the-art MCFT. The Vista System was designed as a great way to hold and display signs. There are all sorts of variations that they offer to consumers. These sign holders serve a very important purpose. People need a way to display their signs. Maybe they want to display them on a table. Maybe they want to display them on the wall. Wherever they want to display their signs, they are sure to find a good-looking solution from Vista System. This is a company that only uses the best materials. They use polymers, plastics and all sorts of metals. These are sturdy sign holders that are sure to stand up to wear and tear. People do not need to worry about displaying their signs in rough places with the Vista System. These displays will not break or wear down. They are tough and secure. These sign displays are flexible. People can use them for all sorts of different signs. They can hold signs made of different materials. Vista System has a solution for everyone. The Vista System was designed by professionals who know from experience that signs come in all different shapes and sizes. They have used this knowledge to create flexible, customizable display options that will work for anyone. Users do not have to be sign experts. These are easy to use solutions to common problems. There really is no reason to wonder why the Sign Store is selling so many of these great products from Vista System. All of the products that have been offered from this company are top of the line. However, they do not rest on their laurels. They continue to innovate and come up with new solutions to the common real world problems that face people on a daily basis. These are quality products that will stand the test of time. A sign can be very useful. They can be used in business meetings. They can be used to attract customers. They can be used to communicate safety and health information. The uses for signs are almost endless. However, people always need to have good, secure frames that they can use to display these signs in the proper areas. A sign frame that's meant to be used on a table will not work very well for a sign that is being displayed on the wall. This is the reason that it's so great that Vista System offers such a wide variety of signs. Everyone can find exactly the right steady and secure frame for the signs they need to display in their proper locations. 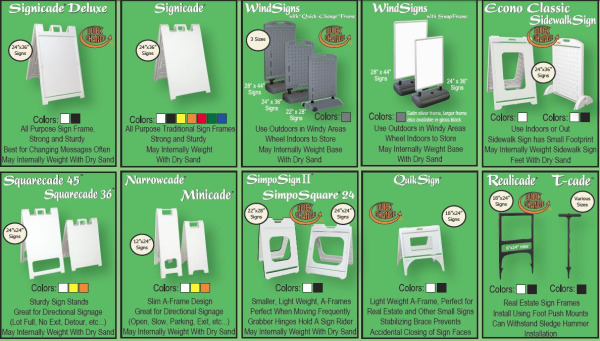 Anyone who wants to find a nice display for their signs should stop by The Sign Store and check out the different Vista System products they have to offer. Or send an e-mail to Info@SignStudioLA.com for more information or a quote. You can also reach The Sign Studio by calling (818) 843-9200. LA Sign Co. | Logo & Sign Design Graphics Will Advertise For You! The Sign Studio is a full service sign-making manufacturing company where expertise comes in the form of three's, and that is provided by Julie Ramirez, Bill Bates, and Chris Ramirez. Our state of the art computer assisted sign making techniques and systems create cost-effective signs with high impact results. Not only that, but the company makes the entire process simple for their clients. The first points of contact are typically Julie Ramirez, the company's Marketing Specialist, or Bill Bates, the company's Art Director. The two typically work together as a team, which is why clients often reach them first. When they work together as a team, they are able to identify the needs of their clients through the development of cost-effective design solutions that will product high impact results. When it is time for the project to move from its design concepts and into reality format, the owner of the company, Chris Ramirez begins his process of the job. Chris, who is also Julie's husband, oversees the production and installation process for every project, while often working on the fabrication work himself in The Sign Studio showroom. If there are elements of the signs requiring any outsourcing to other companies, this portion of the process is very closely monitored. The company was established in 2000 and has been proudly serving Glendale, Burbank, Pasadena and the Los Angeles area since. Bill's colleagues often describe him as, "an awesome designer," and he is experienced in creating "signs of all kinds," including ADA compliant signage, banners, displays, exhibits, menu boards, yard and digital, and window and vehicle graphics. He can even produce your logo design, RTA lettering and graphics that clients can apply to any surface they desire if they would rather purchase the materials and finish the job at their convenience. LA Sign Co. | Custom Signs & Banners Will Always Do You Right! Los Angeles Sign Co. | Custom Signs & Banners Will Always Do You Right! Need to attract attention? Advertise a grand opening or special sale? Want to cement your brand in the minds of the public? Nothing helps to leave a great impression like a banner sign does. It helps define your business and a well-designed sign will attract plenty of eyeballs. If you’re a retail business looking to increase sales (and what retail business is NOT looking to increase sales? ), all signs point to, well signs. In the bricks-and-mortar world of business, signs and banners still rule. Branding is one of the most valuable reasons for a sign. An attractive sign with high visibility is vital for any business to actively compete in these tough economic times. No matter how old school it may seem, an attractive, quality sign is still one of the best ways to drive traffic to your business. Having a well designed, quality sign is important for your branding, advertising your location and promoting any sales or special offers you have. You need to use the appropriate type of sign for your unique situation. Signs can be secured to a wall or pole, hung in a window or be temporary, a category which includes vinyl banner signs that can be hung or suspended. There are also flag style banners and signs that have enjoyed increased popularity in recent years. These tend to be colorful and are extremely easy to set up and take down. Another consideration is how much lighting the sign is going to be exposed to. If there’s bright lighting or strong glare, using a matte finish will help increase visibility. Where your sign is located and what type of conditions it is expected to endure are two of the most important considerations. The elements can fade and/or damage a sign. These include sunlight, wind, rain and snow. If you plan on using a vinyl banner sign, consider one with wind slits in it to keep it from blowing away or becoming damaged in high wind conditions. You’ll also want your sign to be designed with your logo, branding, colors and any other elements of your business marketing. This includes contact information, store hours and any other pertinent information. So whether it’s for branding, advertising your business, promoting sales and other specials or simply to increase foot traffic, a sign is essential for any type of business with a physical location and puts your message out there for all to see. There is something about a professionally designed metal plaque that indicates a businesses' performance and stability. Various metals have been used over the years for that purpose. Bronze as an example is held in the highest regard and has been used for signs and plaques since ancient times to mark and commemorate famous sites, rulers and events. Today, variations of Bronze and Aluminum Plaques are used for a multitude of purposes including: dedication plaques, logo plaques and a host of other purposes. These enduring metal plaques are traditionally used in a number of situations that call for special recognition for achievements, contributions, donations and related purposes. Examples of how Bronze and Aluminum Plaques are used are listed here. It is human nature that those sponsors, benefactors and contributors to various causes, charities or academic and businesses love to be remember for their deeds. A classy but unpretentious way to accomplish that are with a personalized Bronze and Aluminum Plaques used as Dedication Plaques or Logo Plaques. Metal Plaques instill importance to the contributions of these people that will last permanently at the site of those good deeds and accomplishments, preserved for posterity for the ages. Creative sorts involved in notable causes have used plaques as a fund raising tool. For example, personalized plaques commemorating a cause are sold to contributors to raise money for that cause. Those plaques are often personalized with that person's name who in turn proudly displays it on his building or in his office. Bronze and Aluminum Plaques are used in and on some of the most prestigious buildings in virtually every city and town across the nation. There is something quite stately about using an impressive metal like bronze to mark the location of a historical building or of a building that is otherwise significant. People seem to relate the richness of bronze to importance and significance, a tradition that has gone on for centuries all through the world. 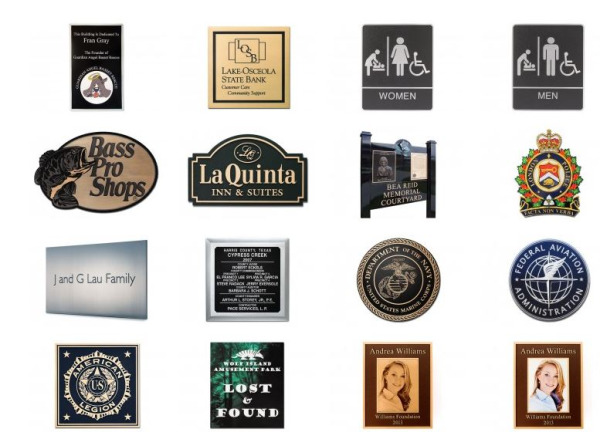 Using bronze and metal plaques as dedication Plaques or company logo plaques are often used by organizations and businesses. These metal plaques can be easily customized to represent a specific era and made to look as old as the information contained. Modern techniques allow a custom bronze plaque to be made in small production runs as small as one individual piece. That same modern technology used by highly skilled and creative in-house signage experts at The Sign Shop can create intricate designs and custom fonts, patterns and logos that reflect your personal or corporate style and image. Using artwork submitted by our clients, images can be added to metal signs or logos. Color and patina can be added and plaques can be artificially weathered to add even more authenticity and age. The results are a beautiful custom sign that adds a distinctive look and a sense of history to a place, person or event. Give our company an opportunity to impress you with our impressive custom signs. Contact the experts at The Sign Studio today for classy, affordable sign plaques. The Sign Studio (818) 843-9200 or send us an e-mail at info@signstudiola.com. While the passage of the Americans with Disabilities Act (ADA) has opened doors that were previously closed for many – sometimes literally! – the law has a number of complexities that still elude many businesses. The desire to comply with the ADA may be there, but knowing how to do so is another story entirely. At the same time, compliance with the ADA is essential in order to avoid the legal and financial complications that come with non-compliance; if nothing else, the costs of these complications far outweigh the costs of compliance! One of the most important ways a business can comply with the ADA is to provide the appropriate signage. Information is often the most powerful tool a disabled person can have; just knowing where they can park and where they can access a ramp or elevator is key to safely and successfully navigating a space. Compliance with ADA signage regulations is actually one of the simplest, easiest, and most affordable ways you can meet all of the requirements of the ADA. How to Make Your Lot ADA Compliant First, you should find out if you actually require accessible parking. 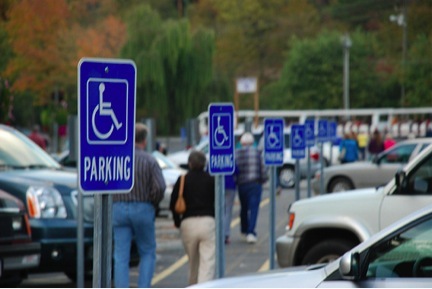 If you have a lot where parking is provided for the public, whether they are clients, guests, or employees, then you are required by the ADA to have accessible parking; thus, if you have a parking lot, you should have accessible parking. The number of accessible parking spaces in your garage or lot depends on the total number of parking spaces in your garage or lot; for example, if you have between 51 and 75 spaces, you are required to have at least 3 accessible parking spaces. These spaces should be located as close to an “accessible route of travel” adjacent to an “accessible entrance” as possible. Obviously, the closer the parking space is to the best method of travel for someone who is disabled, the better the parking space is. This is why you typically see accessible parking as the nearest spaces to a place of business, right next to a ramp. Sometimes, the natural geography of your parking lot is not conducive to the placement of accessible parking. You may have to have the slope of your parking spaces and access aisles altered, as they must not exceed one unit vertical to 50 units horizontal in any direction. If they do, this could prove a danger to whoever parks there.f course, an accessible parking space is pointless if it doesn’t have the requisite space for individuals to use. That’s why your parking space must also provide an “accessible aisle” on the passenger side of the vehicle’s parking space. “NO PARKING” needs to be written within the 5-foot loading and unloading access aisle, so that other cars know to respect the accessible parking space. A bumper or curb can also be used to prevent cars from encroaching into walkways, parking spaces, and aisles. A Sign of the Times As we mentioned earlier, it is important to clearly identify spaces, routes of travel, and means of access for disabled individuals. Parking spaces for persons with disabilities must be identified using the reflectorized sign you typically see that identifies something as accessible for persons with disabilities. Those signs should be permanently posted and clearly visible so that they can’t be easily tampered with or missed. The exact positioning of the sign has some leeway, but generally speaking, it must be clearly visible to everyone. It’s important to let people know that there are accessible parking spaces in your lot or garage at the entrance, as this allows for individuals who require those kinds of accommodations to take that into consideration before entering. Additionally, warning that individuals who park in those spaces who do not have the right identification – think “person with disability” placard or license plate – will be penalized for unlawfully parking in those spaces is important as well. To further identify the space and warn off those who might mistakenly park there, it is required that you identify the space by having it painted or by using the international symbol of accessibility on the ground. Oftentimes, images are far better at communicating a message than words, and the bigger the image, the more likely it is to be noticed. In the end, it isn’t difficult at all to comply – it just takes the time and effort to make your parking lot or garage work for Americans whose disabilities otherwise make it difficult for them to do business with or work at your company. It’s the right thing to do. Finish The Sign Studio is here for you – On time and on budget! Yard Signs aka Coroplast Signs Will Advertise and Make You Money! Designing a spectacular graphic, icon or slogan is a great start to a successful outdoor advertising campaign, but weather can reduce it to a mere pulp in no time at all. If you want a highly visible, durable ad that's softer on the budget than a billboard but won't vanish or disintegrate in bad weather, it's time you looked into yard signs to promote your business or cause. Coroplast - What is It? You may have heard the term while shopping for cheap signs, but what exactly is coroplast? A combination of corrugated design and plastic material, coroplast is the material of choice for yard signs due to its sturdy and waterproof properties. In combination with special printing for text and vinyl overlays for pictures, many advertisers consider this type of sign the best sign material option for outdoor campaigns. If you've ever had a banner tear or sign blow away, you know how frustrating it can be to have to replace these advertising materials. Yard signs made of coroplast are generally fitted into wire frames, enabling them to be swapped out or simply pulled up and moved to a new location when necessary. This versatility makes them ideal for businesses that frequently change promotions or locations - no trailers, moving men or complicated assembly is needed! A popular choice for political campaigns, lawn signs are often used as election signs to get the name or platform of a particular candidate in the public eye. The economical nature of coroplast signage is ideal for mass distribution to candidate supporters, enabling them to purchase and display their candidate's signs in yards and common areas with ease. As the time to vote draws near, supporters can offer to move their signs to roads along the polling route to capture the attention of voters. If the dates, locations or times associated with your ad change - such as an annual church bazaar or an open house showing - you also have the option to leave a space on your sign blank. This space can either have information taped to it or written in with dry-erase marker (depending on weather, of course). This allows your new yard signs to be useful for many events and makes them an extremely economical choice! When the event is concluded, simply wipe or peel off your date information and stash your signs in storage until the time comes for display. Your sandwich board is often a potential customer's first introduction to your business or event. That is why it is so important to make a great first impression with the perfect board. You want one that is eye-catching, durable, space-appropriate and affordable. If you are unsure of which board to choose, then you have come to the right place. Check out some of our most popular offerings below. This 24" wide by 45" board is a customer favorite. The Signicade is especially good for restaurants, salons, fairs and events. It has regressed face areas to help protect the sign from weathering, receives vinyl, acrylic, or metal blanks, and has a handle molded in for easy travel. It comes in yellow and white and can accommodate text only or full color graphics. This deluxe version of the original Signicade features a patented "Quick Change" feature that allows you to switch blanks at lightning speed. stay tabs that hold your graphics securely in place, eliminating the need for Velcro or screws which can sometimes damage a board. If you need durability, ease of use and the freedom to change your signage often, the Signicade Deluxe is the choice for you. The Simpo Sign is 34" high and 23" wide with a display area of 22" by 28". These eight pound, polyethylene signs are prized for their durability. High-density polyethylene makes the sign stain-resistant and easy to maintain. It comes in one piece - no latches, clips, bolts or other added parts - with nested stacking lugs molded right in to prevent sliding. Like the Signicade and Simpo Sign, the Quick Sign is made of high-density polyethylene. Blanks easily slide into and out of the sign, allowing you to change the display in seconds. The plastic frame does not rust, stain or require special maintenance. It measures 30.5" high by 26" wide and has two 18" x 24" frames for blanks. The Quick Sign weighs roughly 6.8 pounds. This sign is simple to put together; it requires no tools to assemble it or to change the blanks. It weighs 10.3 pounds, measures 40.7" x 30.66 inches and takes up very little space on the sidewalk. It has a 24" x 36" frame for blanks on each side. It is available in black or white. This is only a sample of the wide variety of sandwich boards available. 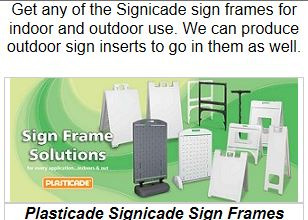 The sign studio is pround to be one of Plasticade's Top Distributor's in California. Also, be sure to stop by our Sandwich Board page to view some of the boards that we have designed for clients.